I was thrilled when Vitamix approached me to do a collaboration.. 1. because I love to cook + 2. their new collection of blenders are eye candy for your kitchen. I decided since I was having a slow moving Sunday I would show you all one of my favorite things to eat when the warmer weather kicks in. I love myself a good Acai bowl and while I can never cheat on Restore Cold Pressed, I have been experimenting with making my own. Take a look at this super easy + delicious recipe! This recipe is SO EASY. First add 1 packet of Acai mix into the Vitamix (or whichever blender you own) I like to add 1/2 a banana, a few strawberries (2 or 3) and a tbsp of flax seed. Next, you want to add 1/4 c unsweetened almond milk. 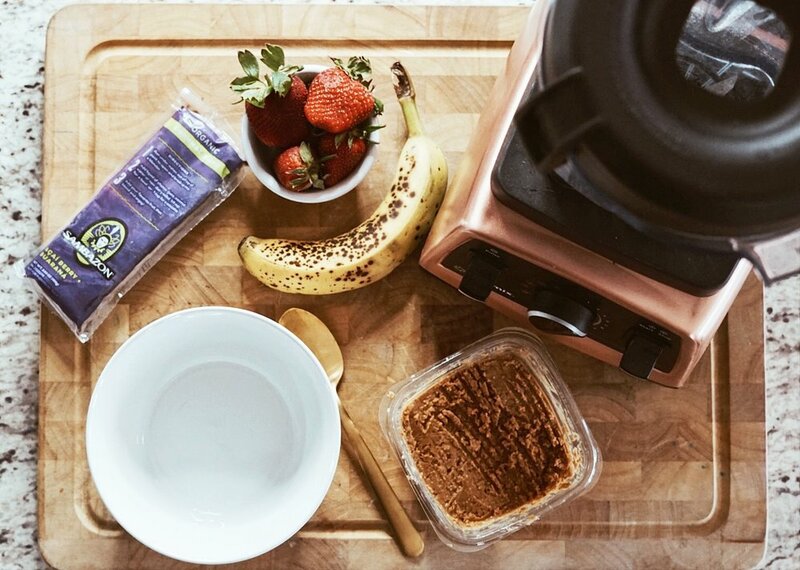 The smoothie bowl mixture should be thick and denser than your typical smoothie. I found that when I ran the acai mix under warm water for to long is made my bowl to runny and more of a smoothie texture instead of what the acai bowl typically should be. Run your packet under warm water for just a few seconds to loosen up a little! The next step is blend! Once you have gotten your mixture to the perfect consistency, your creativity can come out. Top your smoothie bowl with whatever you are in the mood for. I added organic coconut flakes, all natural peanut butter (I warm this up in the microwave for a few seconds so it can be easily drizzled on the bowl), some sliced strawberries + bananas, whole grain oats and lastly sprinkled some chia seeds on top. This recipe took me all of 10 min to make and it is such a refreshing lunch or breakfast!